The Woodlands, Texas – Dana Pritchard, owner of Woodlands Performance & Suspension (WPS) announced that The Woodlands based specialty performance and suspension business is celebrating 15 years of customizing vehicles. WPS specializes in performance, suspension, restoration and customization on cars, trucks, SUVs, and Jeeps, for domestic/import or classic vehicles. Her history includes a long list of working with veterans and first responders. According to customer Kristin Harrelson, “Our family has a tradition of loving classic cars but we are definitely a Mustang family. We have extremely pleased with the work from WPS and we especially appreciate that Dana honors veterans and their families.” Kristin’s Dad, Anton Wagenhauser, served in the Navy and raised his family to appreciate Mustangs. Her husband, Mike Harrelson, also has a father, Rick Harrelson, who served in the Army and drives Mustangs. Dana’s WPS team has restored several of the family’s cars including a 1967 Mustang Fastback that was converted into a Shelby GT500 clone. Customer Stan Jones shared, “I have been searching for the right Jeep to restore and I found one in Georgia that did not have a rusted frame and body. With WPS coming highly recommended, I knew I had to bring it them for the work.” He had owned a Jeep while serving as a pilot in the Air Force and served for 26 years. Now Stan’s 1986 Jeep CJ7 will receive a full frame off restoration from WPS. She continued, “We enjoy getting to know our customers on a personal level and it’s great to hear the stories they tell of the vehicles they bring in to be modified or restored – whether it is an all original one-owner car, or a vehicle they had in high school. They trust us to preserve these precious memories that in most cases will be passed down to another generation.” Pritchard gives credit to her long term Lead Technician, John Henderson for his loyalty and dedication, expertise and talent to WPS as an important part of her success. 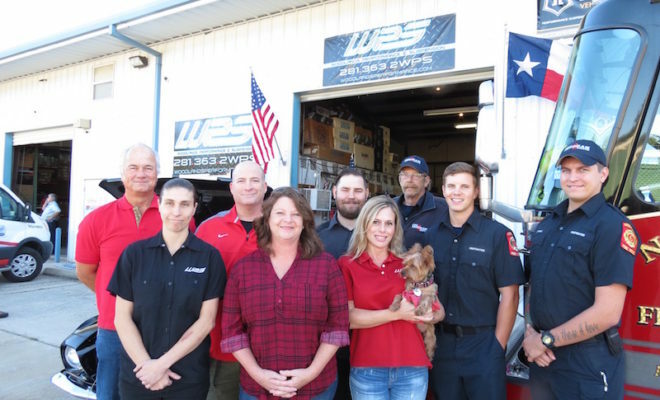 WPS’s relationship with first responders started in the early days of the business by working with the Needham Fire Department’s vehicles including their fire trucks and their boat. Individual Fire Fighters have also been customers. Pritchard is also one of the founding members of The Woodlands Car Club which has raised and donated over $150,000 to over 50 non-profit organizations in Montgomery County, since its formation in 2001, from the charity car related events she organizes – the most popular is TWCC Cars & Coffee for a Cause Charity Car Display at Market Street held on the first Sunday morning of each month. Woodlands Performance & Suspension is located at 1622 Sawdust Road, Ste. A-4, The Woodlands, Texas 77380 and offers a 10% discount to all current and former military and all first responders.